Whatever happened to SPAM? Not the kind that you delete from your inbox, but the kind that you fry in a pan and eat? Its high sodium and fat content should not stop us from enjoying a delectable, easily prepared snack. It goes well with macaroni and cheese, bread, and my favorite- my fork. There’s a whole litany of things you can do with SPAM. 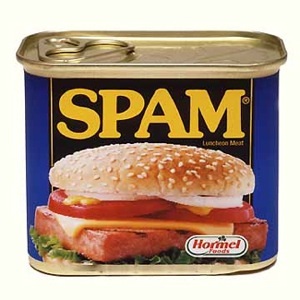 In fact, here are 359 SPAM recipes to start you off. And of course there is no better reference than the official website (because that is the final authority on any subject). So eat up, and enjoy your heart attack. I absolutely love when products are named after their function. They seem to go so well together too. For example, SPreadable hAM and EXcellent LAXative go hand-in-hand.